To some, success might mean setting a clear goal, then crushing it. But Tim Faith, research and development brewer at Goose Island here in Chicago, knows sometimes the biggest wins come when you adjust your aims along the way. Take sports. In high school, Faith thought he’d play football. After two weeks of camp, he realized the complexity of the game didn’t suit him. 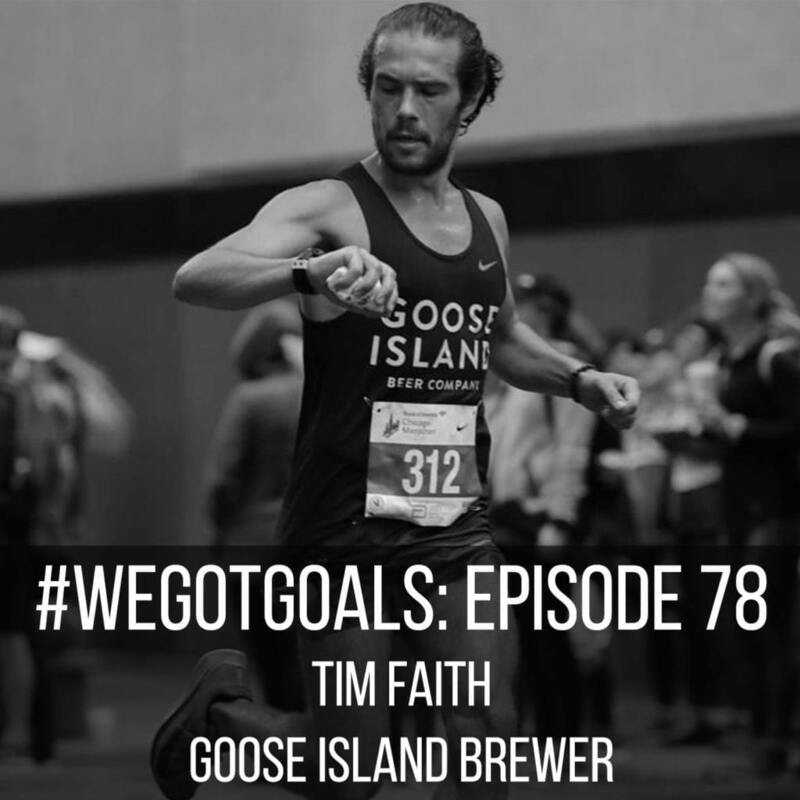 “I’d rather run in a straight line and call it a day,” he told me at Goose Island’s Fulton Street Tap Room, where we recorded this week’s episode of #WeGotGoals. So he joined the cross-country team instead. He was fast, and kept speeding up even after he graduated—his personal-best 5K time of 15:25 came after college. He ran his first of three Chicago Marathons in 2015, and his fastest the next year (a 2:44—and while that’s a swift 6:15 per mile, he knows he’s capable of finishing even faster). More than anything, running became a part of his lifestyle, something that manages stress, connects him with friends, and fuels the creativity required to dream up new brews at one of the country’s most influential breweries. Brewing itself came about due to a course correction. Originally, Faith planned to go to medical school. A running injury the summer before his junior year of college left him with time on his hands; he had a friend who brewed, a process Faith found fascinating. “I realized I was a pretty boring person because all I did was run,” he said. So, he started dabbling in homebrewing, too. He spent part of the next year working at a medical company in Australia—and drinking his way to a better understanding of lagers and ales. “I ended up spending my life savings on beer,” he said. He pasted labels and scribbled notes into a beer journal, impressions that would inspire his own creations later on. When he got back, Faith scraped together the cash to buy better equipment, then changed his major to microbiology in hopes of entering the beer industry. He did an internship at Great River Brewery in Iowa and got a job there after graduating. After a stint at New Holland in Michigan, he landed at Goose Island five years ago. In his role as R&D brewer, Faith helps the company keep pace with the fast-moving world of craft brewing by constantly innovating, whether that means developing new beers or fine-tuning existing ones. Plus, he sees his operation as critical to staff morale. After the beverage is analyzed for chemical composition, sensory qualities like aroma, and safety, it reaches the ultimate evaluation of flavor—the tasting panel. At Goose Island, they’re held daily at 11 am and 3 pm. Beer’s rated on a scale of nine and perfection is rare—“I don’t think I’ve ever seen anything get eight and a half or nine,” Faith said—and often, there’s a philosophical discussion of its attributes. Between tasting panels, evening events, and the tap deck that’s perched above the brewery’s main floor, Faith has plenty of opportunities to imbibe. So how exactly does he keep running so fast while drinking so much? Early on, he learned how to reduce the impact of intoxication on his training—do workouts early in the morning if he has to, alternate beer and water, cut back the week before a race (in fact, training under the influence while racing sober has led to some of his best performances, he said). He keeps a stash of recovery tools—yoga mats, lacrosse balls—tucked into a walkway of the brewery no one uses, so he can stretch and roll his quads and IT bands during the workday. He also merges his passions in other ways, including meeting up with a weekly run club that leaves from the brewery and joining Goose Island teams for events like the Shamrock Shuffle, the Ragnar relay from Madison to Chicago, and the marathon. Oh, and about the marathon—that’s one more instance in which he altered his target en route. This year, he’d planned to run a fast time again, but a calf cramp at mile 16 thwarted his efforts. So he moved on to his B goal—running exactly 3:12, in honor of the brewery’s flagship 312 urban wheat ale (a feat he’d also accomplished in 2015). Combine that with his 312 bib number—a gift from the marathon to Goose Island—and the result is a near-perfect finish-line photo. Listen to the full episode to hear more about some of the beers Faith has created, his goal for next year’s Shamrock Shuffle, and a preview of what might come to a tap near you soon (including, maybe, an electrolyte beer brewed specifically for runners). And since you can’t taste a podcast, you can also drop by the Goose Island Taproom yourself—it’s at 1800 W Fulton St. If you like what you hear, please subscribe to #WeGotGoals on Spotify, Apple Podcasts, or any other podcasting app, and while you’re at it, leave us a rating or a review. And if you want to be featured as one of our real-life goal-getters in an upcoming episode, just send a voice memo with a goal you’ve crushed, a goal you’re eyeing, or your best goal-getting tip to me at [email protected].